The Writing Center is here to assist you with any writing issue related to your program of study. Writing Center staff will listen to your concerns and provide feedback and assistance in a welcoming, safe setting. The Writing Center provides one-on-one writing consultations, both in person and online, for MSW and PhD students. Our mission is to empower students at the Columbia School of Social Work to become stronger, more confident writers in their coursework and beyond. As a student, you should feel free to visit us with any piece of writing, at any stage, for any writing concern. Writing consultants work together with you not only to improve a given assignment or draft, but to identify and develop transferable skills—how to investigate a topic, collaborate with others, and learn—that will help in any future writing or creative projects. The Writing Center is located in CSSW room 402. Select evening drop-in hours are also held at the CSSW Library Circulation Desk. NOTE: All appointments on our regular schedule may be held online or in person. Online appointments meet through our online scheduler. See our handout “How to make an online appointment with the Writing Center” for instructions on making and joining online appointments. *Our weekly schedule may vary between, and even during, semesters. Always follow the online scheduler for current hours and availability. LAUREN ALLMAN is a graduate of CSSW. She currently works for the NYC Administration for Children’s Services where she facilitates decision-making conferences with families involved in the child welfare system. She has also worked in various schools and outpatient mental health settings. She is passionate about the intersection of clinical work and social justice, and especially enjoys working with MSW students on clinical assessment assignments and literature reviews. MISTEE DENSON is a recent graduate of Columbia School of Social Work where her concentration was in Advanced Generalist Practice and Programming with a focus on Contemporary Social Issues. She also obtained a minor in law and worked in a public defender setting where she gained valuable experience in both legal research and writing. She has also conducted research, facilitated workshops, and served on several committees regarding the issues of power, race, oppression, privilege, and diversity. Through these activities, she gained extensive experience incorporating the PROP lens and concepts into various topics, assignments, and writings. JORDAN MENDOZA, LMSW received her MSW from the University of Southern California, where she focused on clinical practice in healthcare. She now works at Montefiore Medical Center as a medical social worker. Jordan tutored reading and writing throughout college, and she remains passionate about helping others advocate for themselves and others through writing. Jordan most enjoys working on essays that focus on social work theory and its real-world application in practice, as well as self-reflective writing. ADAM PELLEGRINI directs the CSSW Writing Center. He developed his understanding of rhetoric and writing pedagogy from years teaching in the first-year classroom, writing centers and community workshops. He has a professional and scholarly interest in exploring the overlap between direct social work practice and student-centered teaching in writing centers. He regularly draws inspiration from CSSW students, colleagues and curriculum. AMAYA RIVERA is a writer and teacher in New York. She has an MFA from Columbia University and an M.A. in U.S. History from U.C. Berkeley. She has taught writing as an Instructor at Columbia University in the University Writing Program, at BMCC, and as a Lecturer at San Jose State University. She has also worked as a researcher and writer at Mother Jones Magazine. NINA SHARMA has an MFA from Columbia University’s Writing program and an MA from Columbia’s American Studies, Liberal Studies program. During her MFA, she was awarded a fellowship to teach in Columbia’s Undergraduate Writing Program, where she was a lecturer in the interdisciplinary pilot program, University Writing: Human Rights. She previously worked at Baruch College’s writing center. A 2017 and 2018 Asian Women Giving Circle grantee, she leads her AWGC-funded workshop, “No-Name Mind: Stories of Mental Health from Asian America” at The Asian American Writers’ Workshop. Her areas of specialization include: cover letters, personal statements and essays. HANNAH SHELDON-DEAN holds an MSW from New York University and is a freelance writer and tutor. She has extensive experience working with writers of all ages and has also designed and implemented socio-emotional and literacy programming for young people, most recently as the manager of school partnership programs for an independent bookstore in Brooklyn. As a writer, she specializes in literary analysis as well as publications for children and young adults. CHERRANDA SMITH is a CSSW Class of 2017 alumna from Athens, Georgia. She concentrated in Social Enterprise Administration while at CSSW and served as events coordinator for the Black Caucus. She currently works in corporate social responsibility, with a focus on youth and education. She has experience in grants and personal statements. ASHLEIGH WASHINGTON is a 2009 graduate of CSSW where she received her MS in Social Work with a concentration in social enterprise and administration and contemporary social issues. Over the last ten years, she has served as an administrator and leader in the nonprofit and public education sectors. As social entrepreneur and freelance writing consultant, she has experience with coaching and training individuals to develop their skills in technical writing, proposals, resumes, cover letters, presentations, and essays. Students may schedule appointments as many as 14 days in advance, and up to the session start time using our online scheduler. As the Writing Center is a busy service, we suggest you schedule appointments as far in advance as possible to secure your desired day/time; that said, please schedule responsibly, and if you need to cancel, do so as soon as possible to free up that appointment time for other students. Students may choose 25-minute (half) or 50-minute (full) appointments, whether scheduling in advance or dropping in. Each week (Monday to Sunday) students are allowed 50 minutes of scheduled appointments, and an additional 50 minutes of drop-in sessions. Each day, students are allowed up to 50 minutes of appointments, whether scheduled, drop-in, or a combination of the two. You are allowed one missed appointment per semester. The system automatically blocks a student’s ability to cancel or manage an appointment within three hours of the scheduled start time. NOTE: If this is your first time making an appointment, be sure to read The Writing Center Signup Policies (PDF: 2 pages), which details sign-up policies and instructions on how to schedule or drop in for appointments. How do I schedule an appointment for an online session, and how do I join the session? Sign into our online scheduler and click on an available appointment slot, marked in white, for ANY staff resource. In the appointment form pop-up, choose Meet online in the drop-down menu. A few minutes before your session start time, sign back into the online scheduler, click on your appointment and, in the appointment form pop-up, click Start or Join Online Consultation. When prompted, click to ALLOW ACCESS to your video and audio. NOTE: Using Firefox (or Google Chrome) is required for the video chat function. Finally, if you have a Word document you are working on, upload it by clicking the arrows icon on the top right side of the screen. Alternatively, copy and paste your text into the whiteboard of your online meeting. For more detailed instructions with visuals as well as tips for best use, please see our handout How to Make an Online Appointment at the Writing Center (PDF: 9 pages). If you are having difficulty accessing your online meeting, email your staff resource at the Lionmail address listed at the top of your appointment form in the online scheduler (click your appointment to access). Should I choose a 25- or 50-minute session? We encourage students to view 25 minutes as half sessions and 50 minutes as full sessions, and recommend that students choose full sessions as often as possible. It takes time to do a thorough review and discussion of a draft, and more often than not, the discussion opens further areas for revision than the student anticipated. In online sessions, factor in time for getting situated with the technology, and for communicating remotely. We find half sessions (25 minutes) to be more productive for shorter writing projects, or for students with a focused set of questions. Occasionally, a student who is developing a draft may find it helpful to schedule two half-session visits in the same week. How many sessions can I sign up for per week, and what happens if I need additional time? Students may schedule up to 50 minutes of appointments each week. We offer a “drop-in” system for students in need of additional time, up to another 50 minutes. 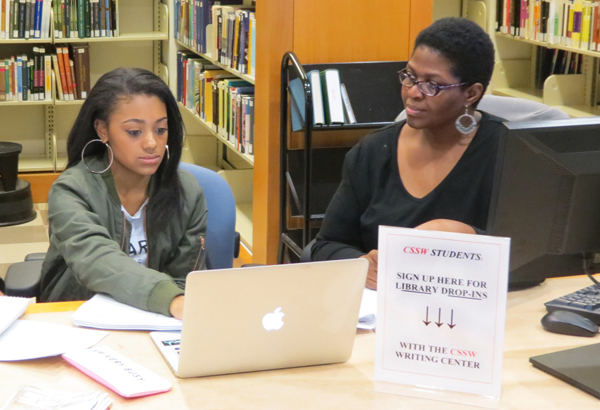 We hold regular drop-in hours at the Social Work Library Circulation Desk (CSSW 2nd floor) on Wednesday evenings. Students may also drop in during regular hours whenever there is a free space on our online scheduler. To drop in during our regular schedule of appointments, find an available time slot, arrive at the meeting location at the start of the session, and ask to drop in. Expect to receive a response email the morning of the requested appointment to confirm or cancel your request, depending on same-day availability of the appointment(s) you specified. The schedule is full—how do I join the waiting list? Students may cancel existing appointments until three hours prior to a session start time—this means that, even during busy times at the Writing Center, availability may change. Join our waiting list to receive notification for appointment times that become available. Sign into our online scheduler, find the day on which you wish to make an appointment, and click the icon just to the left of the day’s date (on the left side of the screen). All students on the waiting list will receive an immediate email or text message when someone cancels an appointment for that day/time. The session will go to the first student to log in and sign up. What can / should I bring to my appointment, and how should I prepare? What to bring: Students may visit the Writing Center with any academic or professional writing project, whether it’s for class, fieldwork or applications. Students may bring documents of any length but should expect to set session goals by the kinds and number of writing concerns presented, the draft stage of the project and the length of the appointment. Having a completed draft, or any draft at all, is not a requirement, and we are happy to brainstorm, strategize and organize with students in the pre-writing phase. Students meeting us in person with a printed draft are encouraged to bring two copies, though we are very happy to work from a screen. All students, whether meeting us online or in person, should have the assignment instructions. Any additional materials—including instructor feedback, class notes, referenced sources, previous drafts or a grading rubric—may be helpful to have on hand. This preparation likely becomes easier with practice, so we recommend scheduling an introductory session with the Writing Center early in the semester to become acquainted. 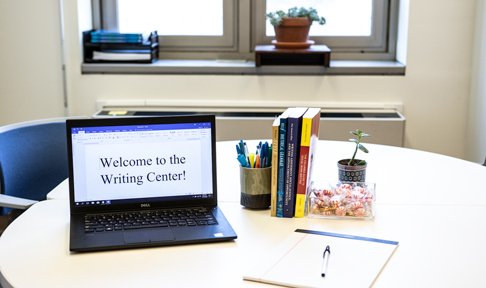 Of course, students are welcome to visit the Writing Center at any level of preparedness, and we can help you gain perspective on your draft and writing process. What other resources does the Writing Center offer? At the start of fall and spring semesters, the Writing Center offers an introduction to APA Style workshop covering basic tips on APA style. During fall and spring semesters, we also offer a series of interactive, skill-based writing workshops held online through Adobe Connect. See our webinar schedule during fall and spring semesters linked under “Quick Links” on the right margin of this page for more information about our webinar offerings and how to RSVP. There are no Writing Center webinars offered during summer. Past webinar recordings are also available upon request. Topics include: APA Style, Literature Reviews, Op-Eds, Reading Strategies, Advocacy Writing, Concision, Paraphrasing, Critique, & Flow. Email with Director Adam Pellegrini (ap3149@columbia.edu) for links and materials. How can I contact the Writing Center (last-minute)? For general questions and concerns, contact Director Adam Pellegrini from 9 am – 5 pm weekdays at ap3149@columbia.edu or 212-851-2232. If you need to contact the Writing Center at the time of your appointment, you may call room 402 at 212-851-2255. Otherwise, please contact us by email. The Lionmail address for your Writing Center resource is listed at the top of your appointment form in the online scheduling system. Go to our appointment sign-up form. We advise you to schedule up to two weeks in advance.